During the 1960s, we saw the development of many aircraft typessuch as swing-wing and VTOL planes. The '60s was also a decade of 'limited' warsand the development of COIN (COunterINsurgency) aircraft. Basically, these wererelatively simple airframes that were beefed up to carry equally simpleordnance. Designed to be operated by those air arms that were not capable ofoperating sophisticated aircraft, many of these aircraft were developed fromtrainers. While many of these COIN aircraft were developed from aircraftsuch as the T-6, T-28, O-2 and others, one that is still being used is the A-37.This was a beefed up T-37 trainer. Four wing hardpoints were added as were wingtip fuel tanks. The cockpit got upgraded avionics as well as ejection seats. Inflight refueling capabilities were also added to the aircraft. In addition therewere retractable FOD screens to prevent debris from entering the engines and a20mm gatling cannon was added. All this extra stuff really increased the weightof the aircraft so larger engines and stronger landing gear were required. Whatresulted was an aircraft that looked like a T-37, but which had fewinterchangeable parts with that trainer. The result was a very capable, jet powered COIN aircraft. Theysaw extensive service in Vietnam from the late 1960s onward. Many were turnedover to the South Vietnamese Air Force and after that country was overrun byNorth Vietnam, many were left and operated by the victors. Back in the US, the A-37 was operated by many ANG and Reserveunits. The aircraft was perfect for FAC (Forward Air Control) and a number ofexamples were modified into OA-37Bs. This modification was mostly in theaddition of radios. The last OA-37 operated by US Forces was retired in 1992.However, many of these airframes have been given/sold to friendly countries inLatin America including Guatemala, Colombia, Dominica, Uruguay, and others. Itsease of maintenance and pleasant flying abilities make it well liked. Academy's kit of the A-37 is reminiscent of the Hasegawa kit,however, it has been brought up to modern standards. It has engraved panellines, acceptable wheel well detail, a separate canopy, nice cockpit detailing,optional refueling probe and a super selection of ordnance to go under thewings. You four fuel tanks, 2.75 inch rocket pods, bombs and SUU-14 dispensers. Naturally, not all aircraft sported all this stuff at once and notall carried four hardpoints per wing. This aircraft is going to be a tail sitterso you will need to put weight into the nose to prevent that. The kit also hasquite a few pieces to it, many of them being rather tiny so it won't be a superfast build. The instructionsare more than adequate giving a brief history, a color chart giving genericcolors as well as FS numbered colors for the camouflage. There are 13construction steps including a chart on which underwing option can go on whichhardpoint. The paint and decal diagram is on a separate sheet. There aremarkings for two aircraft. One is a Korean version from the 8th Fighter Wingcirca 1996. The other is for a USAF aircraft from the 8th SOS in Vietnam around1970. Both are in SEA camouflage of two greens and a tan upper and light greyundersides. The decal sheet is quite comprehensive for this scale. Some of thewhite markings sort of disappeared against the light blue background so it willbe interesting to see if they are opaque enough not to have bleedthrough. Overall it looks like a very nice kit and an improvement overthe older Hasegawa one. 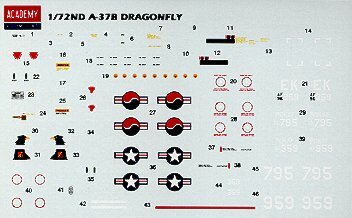 Those wanting to do an ANG OA-37B will have to piecetogether their own decals for those as I seriously doubt if anyone will do anaftermarket sheet for this kit. Fortunately, the markings are simple and shouldnot be difficult to locate. The kit is also available as A-37B 'Black Eagles' (kit No. 1672). Thisversion contains the same sprues - molded in white instead of grey plastic - but different decals and instructions. The large decal sheet(almost the size of the box) contains markings for any of the aircraft of the R.O.K.A.F Black Eagles aerobatic display team for the 1996 and1998 seasons as well as markings for an overall gunship grey OA-37B of 19th TASS, 51th TFW from Osan AB, Korea in the mid 1980s. A complete setof individual numbers and serial numbers is provided. A small table on the painting instructions relates the individual a/c numbers with theserial numbers of each plane for the 1996 and 1998 seasons. Even subtle differences in the paint schemes for the two the seasons arerepresented. The instruction sheet provides information which parts are to be used for each the two paint schemes. Set number SS106 for the A-37B contains seat belts, instrument panel (inthe Eduard PE/film style), cockpit sidewall padding, gun sight, engine faces, FOD screens, tank filler caps and some other small parts. A platewith the name of the airplane, which can be mounted to the base is also provided. So if you want to improve your model without the desire tosuperdetail it, this PE set is probably the easiest way to go. If you would like your product reviewed fairly and fairly quickly by asite that has over 1,500 visits a day, please contactme or see other details in the Note toContributors.